Talent- now that's the problem! I anticipate being leg meat for quite some time! Thanks for all the great info on this forum. read the rule book, and be familiar with refire procedures. Also get some kind of timer(no audible) for the slow fire stage. Even if your timer has audible alarms you can generally run it counting up instead of down. I prefer counting up since it tells me how much time I have used. What you don't want is beep, beep, beep on the firing line. Here's the best advice I can give, though. START!!! I've got a timer that will count up without beeping. I've got a rulebook. I'll look at in more detail. My wife and I have been shooting a weekly informal pistol match for fun at our LGC with Ruger 22/45s. It's a 90 round match at 25 yds using reduced targets for the 50 yd portion. We only switched to one-hand a few months ago when we decided to get more serious about it. If you shoot rifle, you need or should be using a timer there that does not make any noise anyhow. Just buy a kitchen countdown timer, take it apart and remove the noisemaker, or cut one of its connections. They are generally a very obvious black cylinder shaped thing that is located behind a hole in the case where the sound comes out. Screw the timer, get your pistol accurized! I made the jump from Rifle to Pistol this past year. Take some time to read back through past posts on the Fundamentals Discussion Board. There are a lot of good training ideas that don't necessarily require expending live ammo or even leaving your house. Timers...meh...I have and use a timer, but I wouldn't emphasize it as much as this thread has. First I used my phone's clock app (on airplane mode, of course). While at Camp Perry I bought a dedicated timing widget on Commercial Row. My slow fire routine starts with 2 or 3 dry fires to get in the groove, then my 10 shots for score. I consistently finish in 6 min +/- 30 sec. Any longer in between shots and my mind starts to wander, sending my mental game down the toilet. Unless you constantly bring the gun down for wind gusts or stopping a bad shot, I wouldn't go so far as to perform surgery on a kitchen timer just to have a clock in your pistol box. Definitely read the rulebooks. Both NRA and CMP. Also, if you are going to compete as a service member (guessing by your USAF logo) make sure to read your service rules as well. Each service has it's own idiosyncrasies. Yeh, really, what Jon said! He made me laugh, but seriously, accurize the pistol, especially before you go blowing time and ammo on the Ransom Rest. The timer can be important, but way down on the list. nevertheless, killing the noise on a cheap timer is a snap. Don't overthink it. Other posts around reference the Marine Corp workbook. This is a well thought out way with some pre-defined measurements/goals that will lead to a good end. Make sure your match ammo has jacketed bullets. Your list makes it unclear whether you are using jacketed or lead SWC bullets. I disagree with the prior post. See how the gun shoots in the rest, and If it can shoot 3.5" groups, you are going to be fine. I'm still shooting a stock Springfield with a trigger job and nothing else. I'm at 28 points right now with that gun. The gun isn't to blame for my inability to finish the deal. Make sure that your trigger weight isn't too much more than 4lbs. It's hard enough for a new shooter to become adroit at shooting the 1911 with a 3.5lb trigger, and if yours is 5 or 6 lbs, that's going to be a problem. Also, +1 on shooting some matches with it. Get out there and find some NRA matches too. It's good to fire 90 shots under match conditions with that gun to really get comfortable with it in match condition. The Speers I bought for matches are jacketed. I shoot as a civilian. I never heard of the CMP, Service Rifle or Service Pistol until I had been retired for years. I guess that's why there are only a few hundred AF Distinguished Pistol Shots and Distinguished Riflemen. I have the Rest and I'm retired, so I have the time. I'll see how it shoots before doing anything to the RO. Instead of a timer, I downloaded the free Bullseye app for the phone. It has the three timers with commands and start/stop buzzer. I put the earbuds under the muffs. No. 1 thing missing from the list. Get a good open sight .22, learn how to shoot slow fire and sustained fire using it for about 1 to 2 years. If you train every day on the individual shot process components, have a coach, and can dry fire 6 times a week for about 20 - 30 minutes, do some light weights and grip exercises every day; live fire 2 days minimum per week, you can probably reduce the time by half. No. 2 item missing from the list. Get a diary, journal or whatever you want to call it and get started recording pretty much everything. Eventually, you will find out what you need to write down, how you want to track scores and improvements, etc. For open sights, I really used my notes on sight settings and shooting conditions on various ranges and times of the day. No. 3 item missing from the list. Put a very, very small dot of white, essentially just larger than a good dust speck (think period at the end of a sentence in your local newspaper for size) on the front sight about in the center, using a toothpick or pin. Take your shooting position. Dry fire against a white wall in normal light. If you cannot see the white speck clearly, make an appointment with the best ophthalmologist you can find that understands pistol shooting. (Really good open sight shooters can see the serrations clearly on the front sights. Don't get too wrapped up about the gun or ammo, most everything outside the 8 or 9 ring is the shooter. Great advice from a lot of good shooters here, I will just add start competing in CMP matches right away regardless of whether or not you think you are good enough to get points. 30 shots leaves no margin for error and if you have years of practice and build-up without actually shooting CMP matches you will put too much pressure on yourself. I made this exact mistake over the last few years, part of it is due to the fact I can only shoot 2x local CMP matches a year (Active Army has additional rules restricting number of matches) and I put a lot of pressure on myself for those matches. Long story short, don't make the same mistake as I did. Get in the game early, relax, have fun and don't structure your shooting year too rigidly around CMP matches. Also, +1 on CR's advice about getting wrapped up on ammo. Find an established recipe, and leave it alone. Don't get hung up on your pistol reloads. There are dozens of excellent recipes for 185jhp that are capable of sub 3" groups. Until you can call your slow fire shots with great accuracy don't waste time tuning your 50yd load. Remember that 2/3 of your score is on the short line where greased rocks can clean a target.I have been a reloader for a long time before ever shooting competitively and have wasted a lot of time on load development that would have been better spent dry firing. Plus, it induces doubt and worry during shooting when your mind should be clear. If you reloaded for service rifle, remember pistol is a totally different ball game. It is way less of an equipment race. Get your gun accurized, absolutely - but you don't need the best of the best. At every match you will see plenty of sharpshooters and experts shooting high dollar guns poorly. To be fair a lot of us are better gun collectors than shooters! Take it all with a grain of salt as I am not distinguished... these are just observations form someone who's shooting career 100% revolves around service pistol. Smokinnjokin has it absolutely nailed. it is about the shooter in this game. i've gone through the process with both pistol and rifle, ammo is not what decides who is above the cut on any given day. very few mention that 2/3 of pistol is shortline and 3/5 of rifle is considered shortline and that is where the focus pays off biggest. enjoy the chase, once you are out, the gains are harder to get. robert84010 wrote: Smokinnjokin has it absolutely nailed. it is about the shooter in this game. i've gone through the process with both pistol and rifle, ammo is not what decides who is above the cut on any given day. very few mention that 2/3 of pistol is shortline and 3/5 of rifle is considered shortline and that is where the focus pays off biggest. I legged out with the rifle last weekend. I never did any load development with the rifle. I shot a load and a jump that several people recommended. 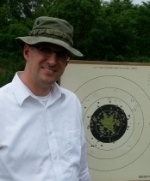 I felt my time at the range was better spent on developing positions instead of loads. It sounds like the same strategy may work here. I loaded up a few 45s tonight to try out the new (to me) RO. I got the recipe here. Congratulations! I thought it was funny how guys would worry about a rifle load but never practice standing. I think you can see the parallels of rifle standing phase and pistol. gotta get that wobble down and learn to break the shot within that wobble. Rifle, that's one of those long things isn't it? I have a 1:7.7 Kreiger and use a 68 Hornady Match for 200/300 and an 80 SMK for 600. I use LC brass, CCI primers, and 25 grains of Varget for both. On the 80s I use an .020 jump.